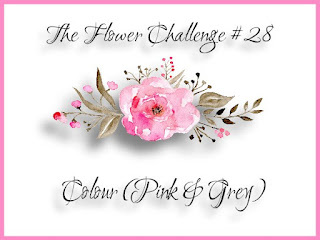 Hello dear blogging friends: THE FLOWER CHALLENGE has reached it's halfway point so I'm here with a little reminder and hope you come and play along. One of my New Year's Resolutions was to use my older stamps and to try not to buy to many new sets, I have a beautiful collection of old and retired sets that I haven't inked up in a long while, this image is from a Flourishes set called "Dahlias" which was released back in 2013. I stamped it on a piece of watercolor paper with Stazon black ink and colored it with SU Markers and Prismacolor pencils. I created the striped panel CASEing a technique my good friend BRIAN KING shared on his blog post and I thought it was really awesome, this is a great way to use your scraps. The sentiment is from a Power Poppy set called Pure Prairie Spirit. I used one of the cutout pieces from the front stripped panel for the inside, I really like how it looks. 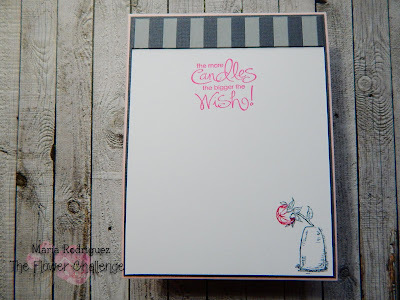 The sentiment is from a retired Stampin' Up! set called "Whimsical Words", which was on the 2010 Sale-a-bration brochure, see what I mean? this set is 9 years old and I neglect to use the awesome sentiments in it for my cards, sheeesh!! The corner image is part of a larger stamp but I just inked up this little flower vase with the Basic Gray and Melon Mambo Stampin' Up! markers. For more inspiration, I hope you stop by THE FLOWER CHALLENGE blog to check out my teammates' amazing creations and come join us in our gallery. Please remember to copy our banner on your post when you upload your card to the gallery, make sure your main image is FLOWERS and limit your other challenge participation to 6, including ours. Your pink and gray is delightful. This is a pretty card that would brighten anyone`s day . Not only are your flowers gorgeous, but I love how you made the stripes! Ohhh, and the embossing and the wonderful, fun sentiment inside. I did make a card for this challenge, but not sure if it fits. Still, it was a joy to make and the challenge inspired me. Lovely layers Maria! My embossing folders jealous you got yours out to play. What a beautiful flower. Before Sonny requests this card you can just mail it to ME! Lol! beautiful card Maria, I like the layout and the pink is so happy. 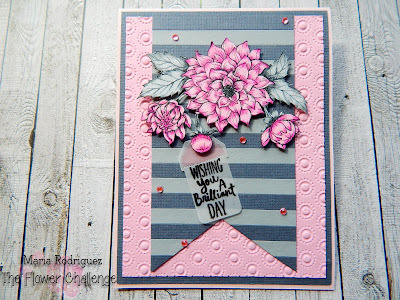 Your pencil shading on floral stamps is always beautiful, Maria!!! And the striped panel using some scrap papers looks great !!! It's something I have to give a try! Beautiful coloring on the dahlia, Maria. The stripes look wonderful and I love that embossed pink panel. Maria your card is beautiful and I love your coloring! Gorgeous job and I love the papers you used as well!